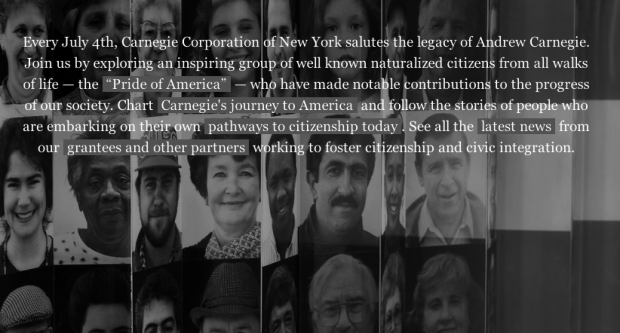 From the website: Every Independence Day, Carnegie Corporation of New York salutes “great immigrants,” naturalized U.S. citizens who have made stellar contributions in a variety of fields, advancing the progress of American society. New York, NY, July 2, 2014 – This Fourth of July, Carnegie Corporation of New York, its Board of Trustees and staff, celebrate naturalized citizens whose contributions have helped to make our nation vibrant and strong. As it has every year since 2006, the Corporation is honoring a group of distinguished immigrants and their achievements in its “Pride of America” full-page public service ad in The New York Times. The Corporation also salutes new and aspiring citizens on a companion website at greatimmigrants.carnegie.org. “We owe the vitality, the progress and the hope we all have for the future of this nation to the contributions that each and every citizen has brought to the banquet table, including those who have come as immigrants, either recently or in the distant past,” said Vartan Gregorian, President of Carnegie Corporation of New York and a naturalized citizen. “Andrew Carnegie was perhaps the best export of Scotland to the United States who subsequently became one of the champions of American democracy and philanthropy.” The 2014 “Pride of America” honorees, 41 immigrants from more than two dozen countries, are leaders in a range of fields. They include Microsoft CEO Satya Nadella, U.S. Ambassador to South Africa Patrick Gaspard, authors Reza Aslan and André Aciman, Carnegie Mellon University President Subra Suresh, Administrator of the U.S. Small Business Administration Maria Contreras-Sweet, Nobel Prize Winner in Medicine Roger Guillemin; musicians Tan Dun and Dave Matthews, actress Sara Ramirez, actor/comedian Aasif Mandvi, and fashion designers Vivienne Tam and Carolina Herrera. Following the mission of our founder, Andrew Carnegie, Carnegie Corporation is committed to promoting citizenship. Together with our civic integration grantees and other partners including the New Americans Campaign, the Corporation is proud to showcase multimedia and blogs of new and soon-to-be citizens sharing their hopes and dreams on the website greatimmigrants.carnegie.org. In addition to easy-to-share videos, the site includes an interactive civics quiz, a timeline highlighting Andrew Carnegie’s life as an immigrant, aa visual archive of “Pride of America” honorees from the last nine years, and an embeddable overview video featuring honorees Steve Chen (Entrepreneur in Residence at Google Ventures and cofounder of YouTube) and Olympic marathon medalist Meb Keflezighi.